To support publishers in meeting their duties under this policy, Google offers a Consent SDK. The Consent SDK is an open-source library that provides utility functions for collecting consent from your users. The full source code is available on GitHub. Ads served by Google can be categorized as personalized or non-personalized, both requiring consent from users in the EEA. By default, ad requests to Google serve personalized ads, with ad selection based on the user's previously collected data. Google also supports configuring ad requests to serve non-personalized ads. Learn more about personalized and non-personalized ads. This guide describes how to use the Consent SDK to obtain consent from users. It also describes how to forward consent to the Google Mobile Ads SDK once you have obtained consent. Sign in to your Google Ad Manager account and select the type of ads you want to show. 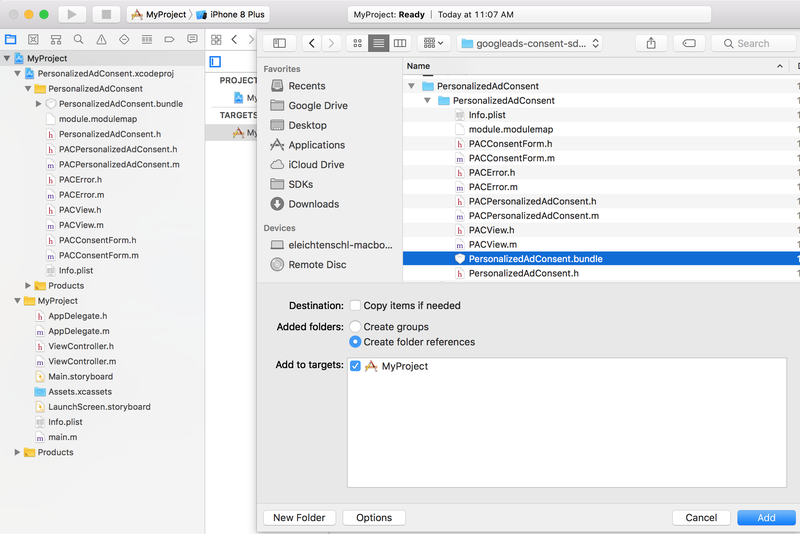 From finder, drag the PersonalizedAdConsent.xcodeproj file into your project. Navigate to the Build Phases tab. Under Target Dependencies, click the + button, and add the PersonalizedAdConsent target. 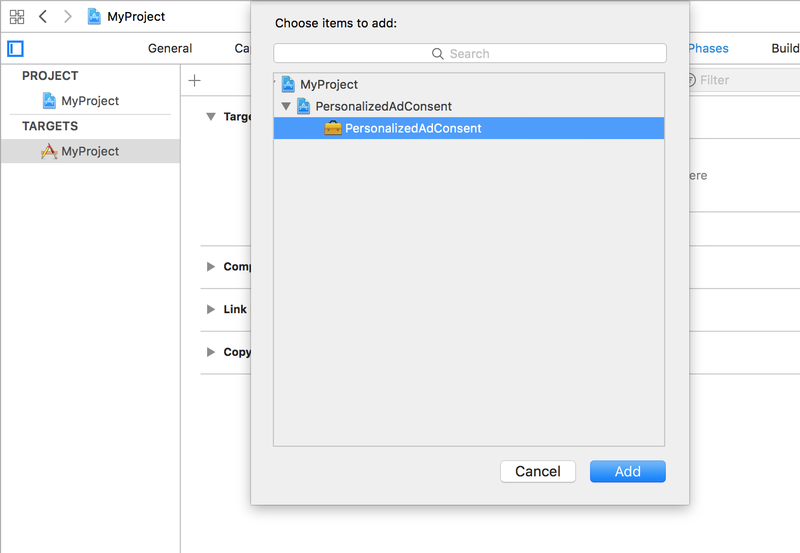 Right-click your project, and select Add Files to "MyProject".... Navigate to PersonalizedAdConsent.bundle. Make sure to check Create folder references. Once this is finished, you should see PersonalizedAdConsent.bundle listed in the Build Phases tab under the Copy Bundle Resources section. Prior to using any other methods in the Consent SDK, you should update consent status to make sure the Consent SDK has the latest information regarding the ad technology providers you've selected in the Ad Manager UI. If the list of ad technology providers has changed since the user last provided consent, the consent state is set back to an unknown state. If you aren't using mediation, you have two options for implementing the Consent SDK to collect consent. One option is to use the Consent SDK to present a Google-rendered consent form to your users. The consent form displays a list of the ad technology providers you've selected in the Ad Manager UI. The Consent SDK stores the user consent response. The other option is to use the Consent SDK to dynamically retrieve the full list of ad technology providers from Ad Manager, as explained in publisher-managed consent collection. However, in this case you'll need to determine how the list of providers should be made available to your users and present your own consent form to your users. Once the user has made a consent choice, you can ask the Consent SDK to store the user's consent choice as explained in Storing publisher managed consent. Upon collecting consent, if a user has consented to receive only non-personalized ads, you'll need to forward consent to the Google Mobile Ads SDK. You can use the Consent SDK to dynamically retrieve the full list of ad technology providers from Ad Manager, as explained in publisher-managed consent collection. You'll need to determine which additional ad technology providers from other ad networks need to be presented to your users for consent. As an app developer, you'll need to collect user consent for both the ad technology providers returned by the Consent SDK and the providers from other ad networks. 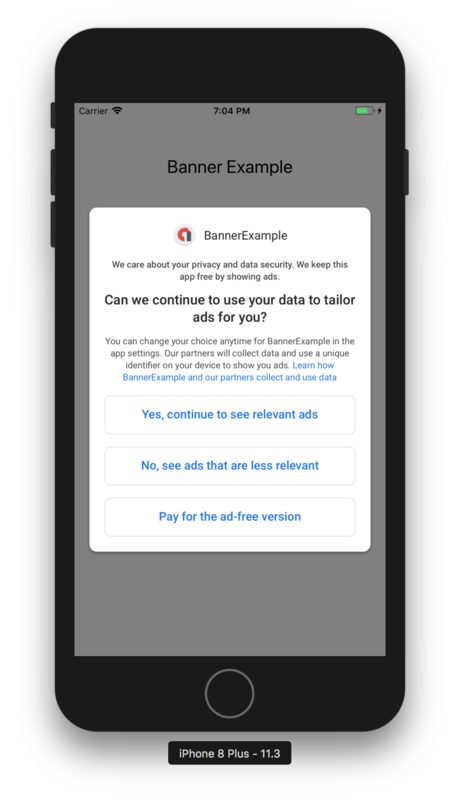 You'll also need to manually store user consent responses and forward consent to the Google Mobile Ads SDK if the user consented to receive only non-personalized ads. Warning: We recommend against using the Consent SDK to store publisher-managed consent if you collect consent for additional ad technology providers beyond those returned by the Consent SDK. The Consent SDK only tracks changes to the list of ad technology providers from Ad Manager, and cannot track changes to any additional providers you may add to your consent form. When using the Consent SDK, it is recommended that you determine the status of a user's consent at every app launch. To do this, call requestConsentInfoUpdateForPublisherIdentifiers:completionHandler: on an instance of PACConsentInformation. // Consent info update failed. // instance has been updated. An array of publisher IDs that your app requests ads from. For Ad Manager accounts, pass your Ad Manager network code. A block that accepts an NSError as an input parameter, which provides information on a failed consent update request. PACConsentStatusPersonalized The user has granted consent for personalized ads. PACConsentStatusNonPersonalized The user has granted consent for non-personalized ads. PACConsentStatusUnknown The user has neither granted nor declined consent for personalized or non-personalized ads. Once consent information is successfully updated, you can also check PACConsentInformation.sharedInstance.requestLocationInEEAOrUnknown to see if the user is located in the European Economic Area or the request location is unknown. If the requestLocationInEEAOrUnknown property is NO, the user is not located in the European Economic Area and consent is not required under the EU User Consent Policy. You can make ad requests to the Google Mobile Ads SDK. If the PACConsentStatus is PACConsentStatusPersonalized or PACConsentStatusNonPersonalized, the user has already provided consent. You can now forward consent to the Google Mobile Ads SDK. If the user has an PACConsentStatusUnknown consent, see the Collect consent section below, which describes the use of utility methods to collect consent. Present a Google-rendered consent form to the user. Request the list of ad technology providers and collect consent yourself using the Publisher-managed consent collection option. Remember to provide users with the option to Change or revoke consent. You should review the consent text carefully: what appears by default is a message that might be appropriate if you use Google to monetize your app; but we cannot provide legal advice on the consent text that is appropriate for you. To update consent text of the Google-rendered consent form, modify the consentform.html file included in the Consent SDK as required. Indicates whether the consent form should show a personalized ad option. Defaults to YES. Indicates whether the consent form should show a non-personalized ad option. Defaults to YES. Indicates whether the consent form should show an ad-free app option. Defaults to NO. // User prefers to use a paid version of the app. // Check the user's consent choice. // The user prefers to use a paid version of the app. A UIViewController to present from. A block that accepts an NSError and a BOOL as input parameters. The NSError provides information if there was an error showing the consent form. The userPrefersAdFree BOOL has a value of YES when the user chose to use a paid version of the app in lieu of viewing ads. After the user selects an option and closes the form, the Consent SDK saves the user's choice and calls the dismissCompletion: block. You can read the user's choice and forward consent to the Google Mobile Ads SDK. If you choose to get consent yourself, you can use the adProviders property of the PACConsentInformation class to get the ad technology providers associated with the publisher IDs used in your app. Note that consent is required for the full list of ad technology providers configured for your publisher IDs. Note: Before you access the adProviders property of PACConsentInformation, you must wait for the successful update of user's consent status as described in the Update consent status section. You can then use the list of ad providers to obtain consent yourself. Upon getting consent, record the PACConsentStatus corresponding to the user's response using the status property of the PACConsentInformation class. After reporting consent to the Consent SDK, you can forward consent to the Google Mobile Ads SDK. Key Point: It is important that the user is able to change or revoke the consent they have provided at any time. To allow users to update their consent, simply repeat the steps outlined in the Collect consent section when the user chooses to update their consent status. If a publisher is aware that the user is under the age of consent, all ad requests must set TFUA (Tag For Users under the Age of Consent in Europe). To include this tag on all ad requests made from your app, set the tagForUnderAgeOfConsent property to YES. This setting takes effect for all future ad requests. Once the TFUA setting is enabled, the Google-rendered consent form will fail to load. All ad requests that include TFUA will be made ineligible for personalized advertising and remarketing. TFUA disables requests to third-party ad technology providers, such as ad measurement pixels and third-party ad servers. To remove TFUA from ad requests, set the tagForUnderAgeOfConsent property to NO. The Consent SDK has different behaviors depending on the value of PACConsentInformation.sharedInstance.requestLocationInEEAOrUnknown. For example, the consent form fails to load if the user is not located in the EEA. To enable easier testing of your app both inside and outside the EEA, the Consent SDK supports debug options that you can set prior to calling any other methods in the Consent SDK. Warning: We highly discourage directly setting debugIdentifiers to the current device's advertising ID. You don't want to run the risk of releasing your app with code in place that overwrites every user's geography. Note: Simulators are automatically added as debug devices and don't need to be whitelisted. Finally, set the debugGeography to your preferred geography for testing purposes. // Geography appears as in EEA for debug devices. After completing these steps, calls to update consent status will take into account your debug geography. Note: The code in this section can be used with any version of the Google Mobile Ads SDK. It can also be used regardless of whether you used the Consent SDK to gather consent. Note: Google's EU User Consent Policy requires that you collect consent for the full list of ad technology providers configured for your publisher IDs before displaying personalized ads, even if you are using a third-party mediation solution to send ad request to Google. If non-personalized ads are requested, the ad request URL currently includes &npa=1. However, note that this is an internal implementation detail of the Google Mobile Ads SDK and is subject to change. How many ad technology providers does the Consent SDK support? The Consent SDK does not impose a limit on the number of ad technology providers a publisher chooses to enable. Does the list of ad technology providers returned by the SDK automatically update if I change my selection in the Ad Manager UI? Yes, if you make changes to the list of ad technology providers in the Ad Manager UI, the changes will propagate to Google's ad servers in approximately one hour.